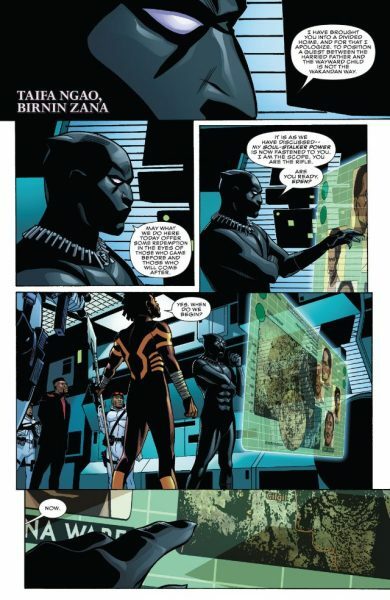 The creative team is slightly different on Black Panther #5, but it delivers another strong issue. Penciller Chris Sprouse takes over for Brian Stelfreeze, but Ta-Nehisi Coates is still behind the story. In this issue, Black Panther tries to find a Wakanda-based enemy, but he may be skirting the line between hero and ruler. While a few scenes work less well than others, it is in general an excellent story. Following a terrorist attack by Ezekiel Stane, and numerous rebellions within Wakanda, Black Panther goes on the offensive. He recruits Manifold, a former Avenger with teleportation powers, to get into him into enemy cells. He comes face to face with a Wakandan man who Stane has rigged (with arc reactor technology) to be a human bomb. The man has joined with rebels because his brother was killed during the Black Order attacks (part of the pre-Secret Wars incursion). Meanwhile, T’challa meets with anti-terrorist experts from a variety of nations. However, they tend to be despots and tyrants rather than democratic rulers, and their advice aligns accordingly. Stane, who has formed an alliance with Tetu and Zenzi--leaders of a rebellion group called The People--then leaks footage of these men giving T'challa cruel advice. One of the things that has been most impressive about this series all the way up to Black Panther #5 is the way that Coates and Stelfreeze have been world-building. For a lot of its history, Wakanda has been treated by writers as a nation with two attributes: home of Black Panther and reservoir of vibranium. However, in Coates’ hands, this is a much more complex nation, struggling after numerous attacks that have occurred in recent Marvel storylines, such Avengers vs. X-Men and Secret Wars. Coates has made Wakanda feel like a real nation in Black Panther--messy and divided, and that’s a pretty major accomplishment. It’s also impressive that an “outsider” writer (this is not only prose writer Coates’ first Marvel series, but his first comic book writing job) has created a series that feels so at home in the Marvel Universe. That is doubly noteworthy because the Marvel Universe has changed a great deal in the past ten years. You would not necessarily expect a writer from another field to throw in the peripheral Avenger named Manifold (from Jonathan Hickman’s run) or to recruit Ezekiel Stane, son of Iron Man nemesis Obadiah Stane, to be an adversary. 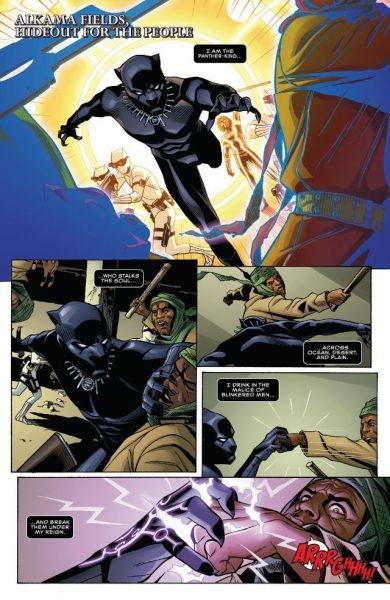 Coates and Stelfreeze have been making Black Panther feel like a deep delve into a corner of the Marvel Universe we have rarely scene in such detail--though it still feels like the Marvel Universe. Sprouse is filling in for Stelfreeze for a few issues so that Stelfreeze can get a head start on future stories in the series. 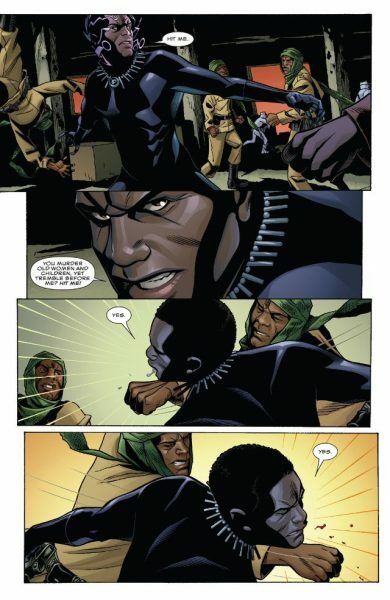 Sprouse’s work on Black Panther #5 is good overall and very good in some panels. It is a little inconsistent, though. Some panels feel awkward and potentially rushed. He does a very nice job on a scene in the middle of the issue that takes place in the Djalia, a living plane that currently housings T’challa’s sister Shuri. In general, the character scenes fared better and the action felt a bit off, but I think Sprouse’s body of work indicates that the series is in good hands while Stelfreeze is gettting ahead. Taken individually, Black Panther #5, like most of the issues of the series so far, is dense. It’s not easy reading because the plots are complex, the allegiances are mysterious, and the language is poetic. This is probably one of those series for which reading the issues without too much time between them--such as when it’s collected in trade format – will help readers. It’s when you read the issues together that you get a sense of the broad story that Coates is telling, and how it will play out gradually in a satisfying way.